MY NEW HASSLE OF LIVING WITH A VEGETARIAN DAUGHTER and A Sort of Shrimp Chowder (serves 4) | Crappy Kitchen - Good Dinners! My teenage daughter made the announcement the other day that she was going to begin the transition to vegetarianism. I knew this day would come and really I should have been happy. I mean, she did not tell me she wanted a tattoo of a butterfly on her ankle or to divorce me as a mother because I failed to understand her. All she wanted to do was not eat meat! I was once standing in her alternative leather shoes so I could really see her point of view, but for now all I could think was: great, just what I needed – one more thing to add to the never-ending list of things I have to think about on a daily basis! This was going to be a bigger adjustment for me than for her. And, it’s not like we are a household of carnivorous beasts either, we tend to choose poultry and fish over beef and pork. My problem is a threefold hassle; (1) I am already eating a specific diet (Read about my Blood Type A diet on the link in the header) and now I am going to have to consider not just my needs but also satisfy my daughter with a vegetarian option while not overlooking my son’s crazy craving for all kinds of sausages! (2) I know there is a solid argument against this, but I told her she would have to allow fish in her diet and to not go down that particular ethical road until after she left the house. But my options for her to have her protein fix for at least our main meal were greatly diminished. Now gone are the days when I can satisfy the entire house by throwing a chicken in the oven surrounded by a scattering of vegetables! The other part of this is that this is the girl who never warmed to tofu (which I love and cook regularly) and is also not a big fan of beans! Will I be reduced to fish dishes and toasted cheese sandwiches?? I am a very capable cook and I pride myself in the fact that my kids grew up immersed in my little foodie-world, but this certainly will cramp my cooking style, which generally consists of rooting in the fridge and coming up with something on the spot. Also, my quick fix for lunch is a tin of sardines with a smear of mustard (which I eat right from the pretty little tin!) but she cannot stand these smelly little fish! In a way it is funny that the most unlikely candidate for a vegetarian diet is the one who does not naturally gravitate towards vegetarian food. As I begin right now to lay this all out it makes me wonder if I should even allow this? I will be the one cooking and shopping and planning, so should it be my decision as to whether she is a vegetarian or not? She is a 13-year old who can fend for herself of course but my kids cook when it is necessary or when they want to. She is far too busy doing all the things young people do for me to make it obligatory that she cook on top of that. I am between a rock and a hard place as I respect her decision, but I also don’t need to complicate my life any more than it already is. I had better move on to my third concern as I could talk about number 2 all day long! 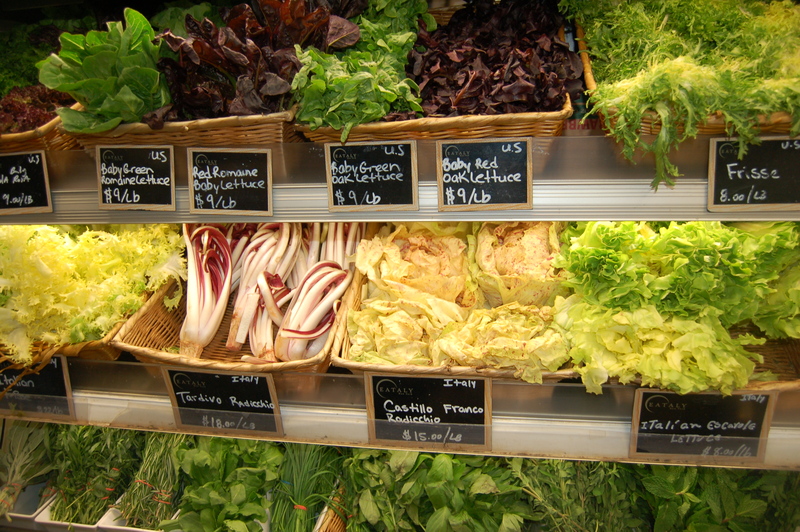 (3) Fish is more expensive by far per pound than most cuts of meat. Take a chicken for example that could feed my family of four. I can buy an organic chicken on sale for between $7 to $10. The same amount of fish is twice the price. When I buy fish I choose fish that is sustainable (check out a great list you can put in your purse from Monterey Bay Aquarium’s Seafood Watch ) which is why it is sometimes a treat to have a dinner which is centered around this delectable protein. 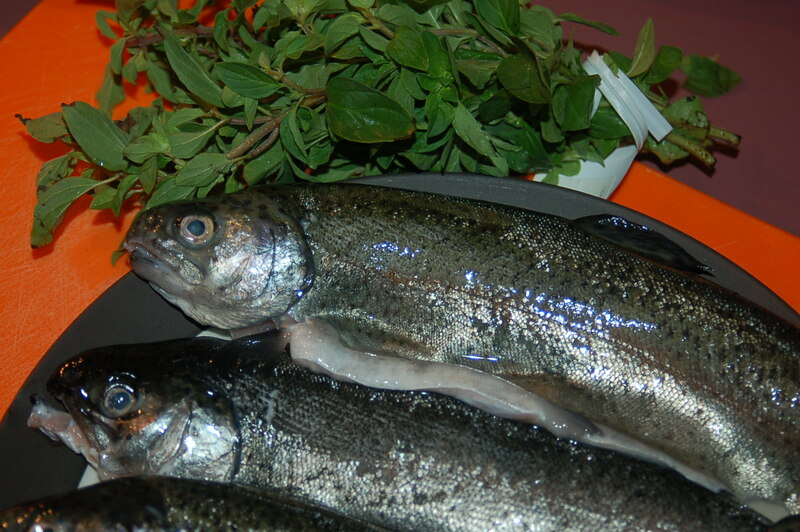 For example the price per pound of rainbow trout is about $8, and it’s the same for a fish like cod or haddock. 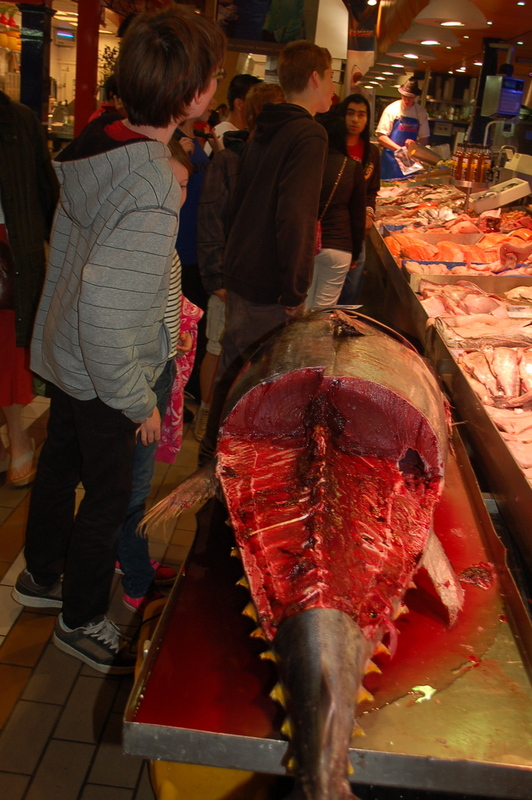 And, that’s only if you are lucky to find it for that price and for it to be fresh and ethically caught. 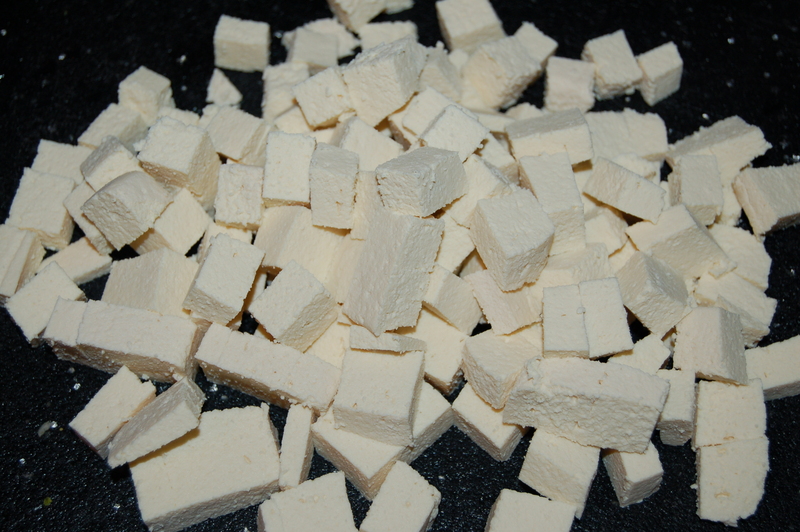 My daughter is going to have to learn to love tofu or this foray of hers is going to cost me a fortune. I wish I could say that money doesn’t matter and cook all kinds of oceanic delights every evening but the cold hard fact is that most people, including me live on a budget. I don’t think this is a bad or shameful thing and in more ways than one am grateful that I am compelled to thinking about certain things in monetary terms. I simply hate where I hear a kid ask his or her parents for things in a way which disregards how much that thing cost or has no clue or concept whatsoever about where their money comes from. Oops, looks like number 3 is also in danger of getting away from me….so yes, fish is more expensive, which is a hassle. Here is what I have decided: I am going to do what I can for now to satisfy my family but I if I start pulling my hair out or resort to looking for pennies under couch cushions, I will call a family meeting to implement change. Or perhaps my daughter will tire of her life choice before I have to look like the bad guy…one can only hope. 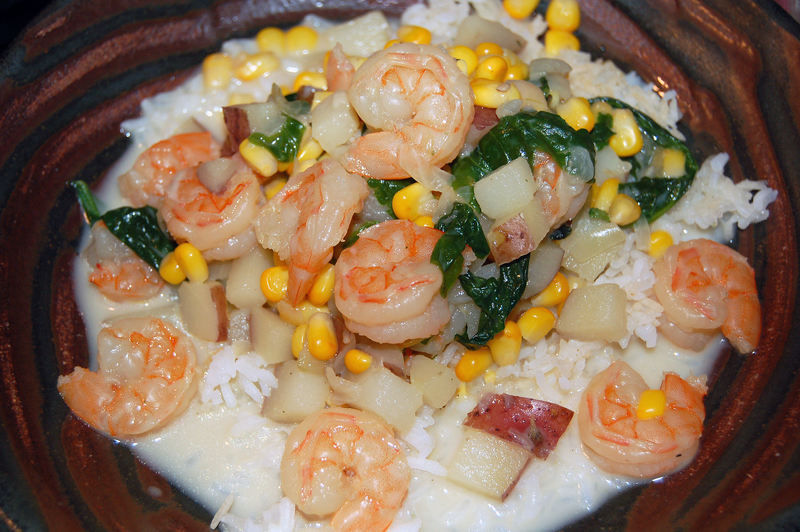 This is what I made for my daughter the other night, and thankfully it was a dish that everyone could enjoy (save for me because of the shrimp!). I called it a “chowder” because that is what it most resembled. A New England Clam Chowder has clams, cream, corn and potatoes and that had commonality enough for me to merit the title. 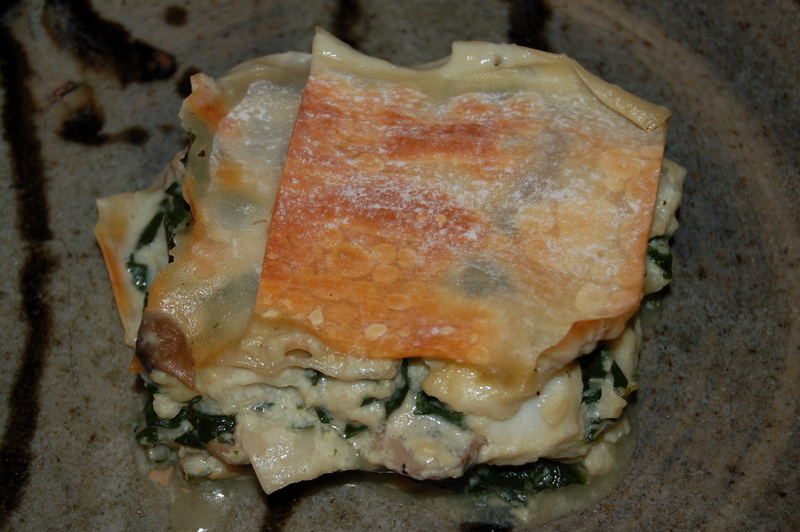 I don’t really like the over-abundance of cream so I cut the cream by using a higher ratio of vegetable stock. It was truly scrumptious. Now I’m just praying that my son doesn’t decide fruitarianism is his dietary destiny! 1 – Pot medium soup on low/medium heat and add the oil. Add the onions and garlic and cook for about 7 minutes, stirring frequently. 2 – Add the chicken stock to the pot, along with the potatoes and sweet corn. Turn heat up and when it comes to a boil, reduce heat and cover. Simmer for about 10 minutes, after which time the potatoes will have just about cooked through. 3 – Add the cream, several good grinds of black pepper and about a 1/2 tsp salt. Bring back to a simmer. 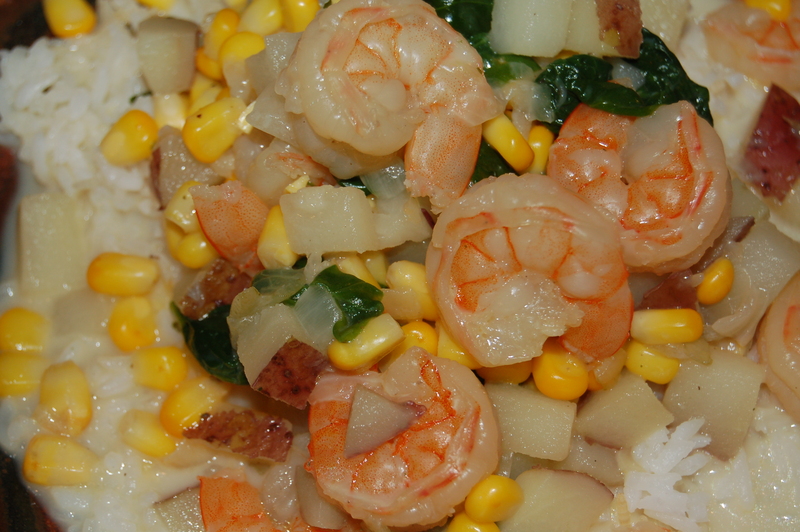 When it begins to simmer, add the shrimp and the chopped spinach. 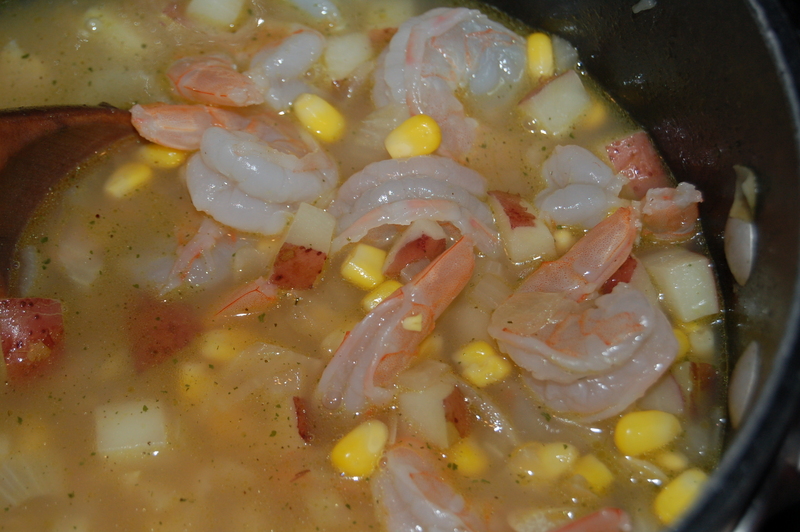 Cook until shrimp have cooked (about 8 minutes). Taste and adjust the seasoning. Scoop a nice mound of the rice into the bottom of shallow plates or soup bowls and top with chowder. 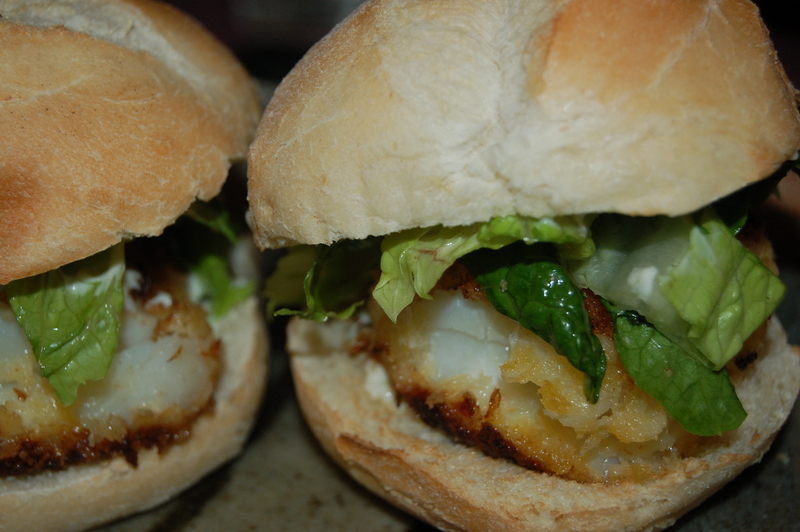 This entry was posted in dinners and tagged chowder, chowder with rice, corn chowder, Eataly, fish lasagna, fish sliders, monterey bay aquarium, monterey bay seafood watch, shrimp chowder, The english Market, vegetarian, vegetarian soup, vegetarianism. Bookmark the permalink.